On my desk lays a pamphlet. And not just any old pamphlet, although it is old. The pamphlet contains two dictionary reviews that were published in 1828. 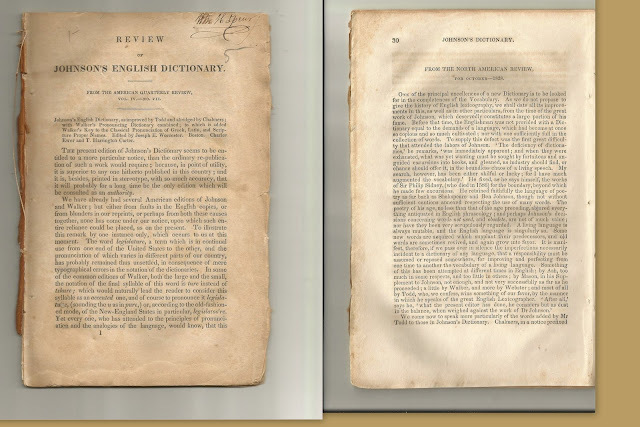 And the two reviews are reviews of a dictionary most dear to my heart: Johnson's English Dictionary; this one edited by an American by the name of Joseph E. Worcester (1784-1865). I've written one blog post about this pamphlet already this month: Some Worcester Sources and Other Discourses Concerning the Dictionary Wars, which is on My Sentimental Library blog. Now, I will write a little bit about the pamphlet itself. Thus far, however, I have more unanswered questions than questions answered. So please consider this endeavor to be a "preliminary examination" of the pamphlet. "Good luck with that," you're probably saying to yourself. As in most other periodicals of the 1800s, the contributors were not identified by name when the articles were published. Surprisingly, however, this question is the only question I can answer at this time. The reviews were first printed in The American Quarterly Review and the North American Review respectively in 1828. Interestingly, the page header printed in the American Quarterly Review was "English Ortheopy" (pronunciation of words). 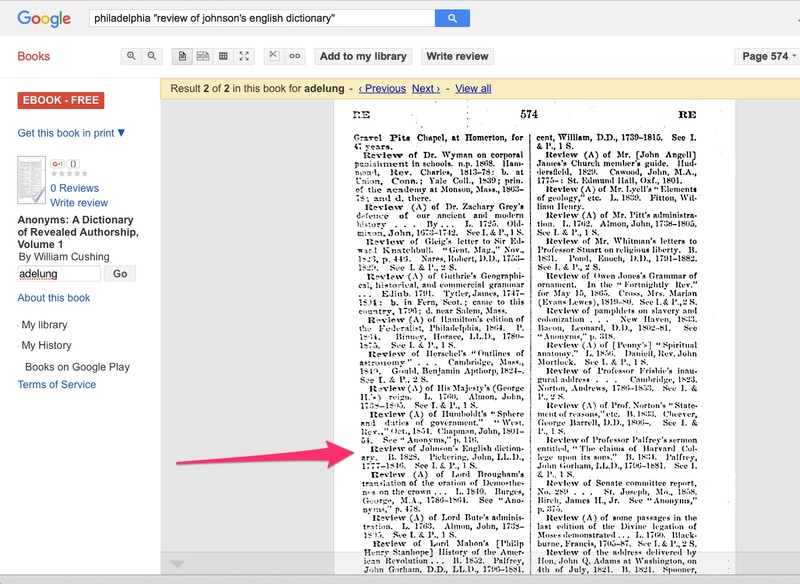 And the page header in The North American Review was "English Vocabulary." 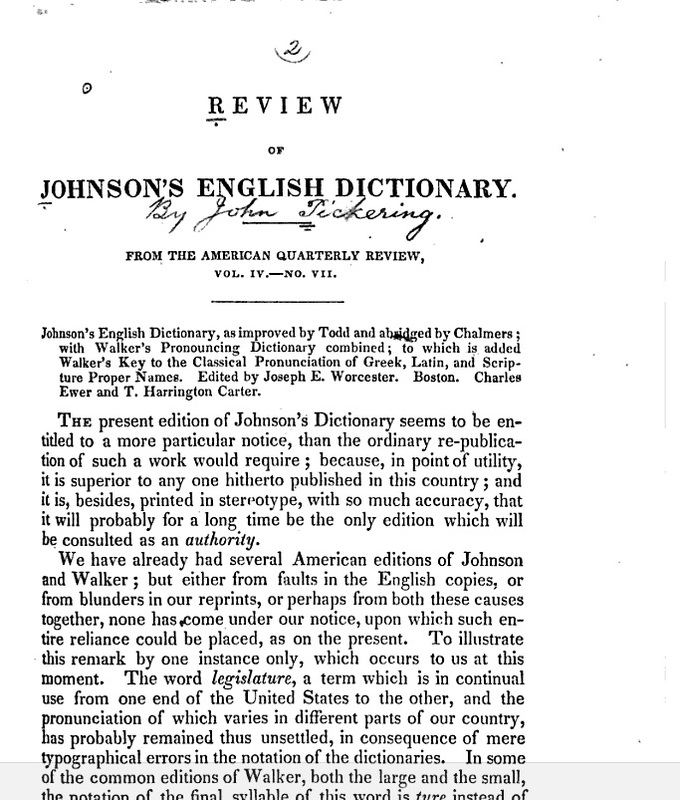 The page header on every page in my pamphlet, however, was "Johnson's Dictionary." In the Widener Library, at Harvard University, there is a copy of A Vocabulary; or, Collection of Words and Phrases Which Have Been Supposed to Be Peculiar to the United States of America by John Pickering, Boston: 1816. 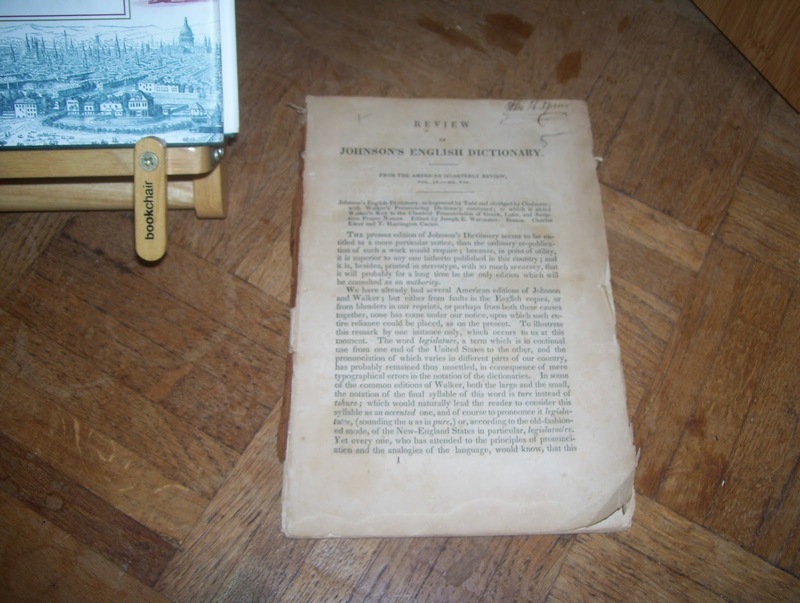 This particular copy belonged to Joseph E. Worcester, the one who edited the edition of Johnson's Dictionary that was reviewed in the two periodicals. And the book was given to Harvard at Worcester's bequest. 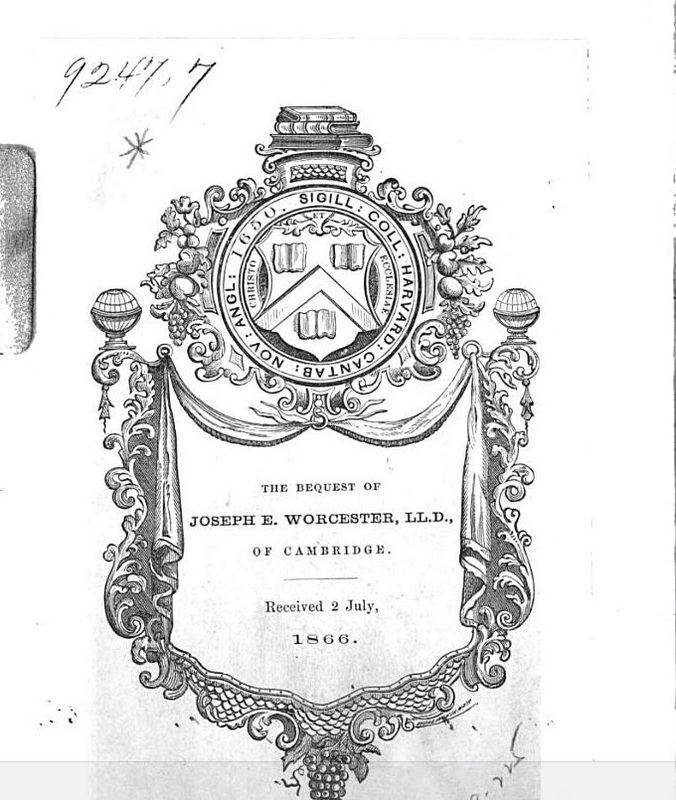 Bound in with Pickering's book were several pamphlets, including the pamphlet containing the two reviews of Worcester's edition of Johnson's Dictionary. And directly below the title of the review from The American Quarterly Review, someone, possibly Joseph E. Worcester himself, wrote, "by John Pickering." And on the review from the The North American Review that was appended to Pickering's review, someone wrote, "English Vocabulary, etc. by Sidney Willard." Dr. Pickering was a man of profound learning in many branches of knowledge and in the department of linguistics has been surpassed by very few in any age (1590). I can verify that Pickering was the author of the review. But the first verification required a little bit of digging and deducing. 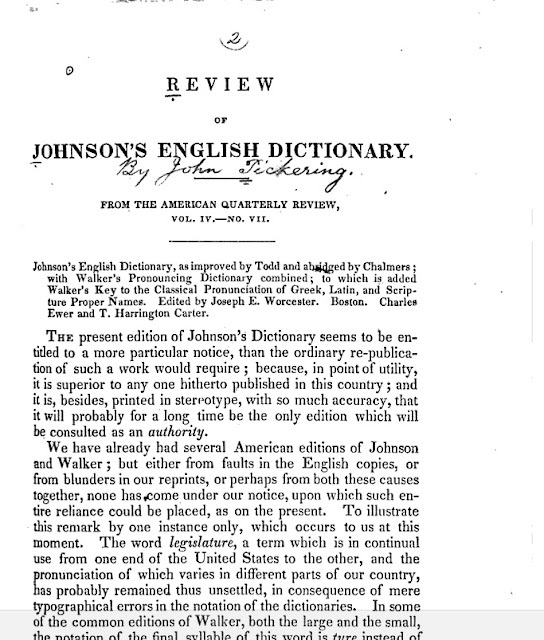 I have examined your new edition of Johnson and Walker’s Dictionary, which, as we are informed by the editor, Joseph E. Worcester, Esq., ‘Is founded upon the great work of Johnson, corrected and enlarged by Mr. Todd,’ and includes ‘the entire labors of Walker on the pronunciation of the language;’ the work being intended ‘to comprise all the most important materials, and to answer all the essential uses of a dictionary for understanding, writing, and speaking the English language, and at the same time to enable the reader to see, as far as possible on whose authority everything rests.' From the examination which I have made of the work, (without meaning to extend this remark to the whole American part of the Appendix) I am of opinion, that it is well adapted to the use intended, and will for all common purposes supply the place of the more copious works which are the basis of it. The editor has performed his part of the labor with much care, and the volume is printed with great correctness; and in this and other respects it is far preferable to any manual of the kind in use. Now someone reading this letter in 1833 might think Pickering's letter was addressed to the booksellers, Russell and Odiorne. But Russell and Odiorne didn't publish their edition of the dictionary until 1833 ( I have a copy of their edition in my library). And theirs, according to J. D. Fleeman, was already the seventh impression of Worcester's edition of Johnson's Dictionary. Charles Ewer and T. Harrington Carter were the publishers of the first two editions of Worcester's dictionary (1828 and 1829). And they are the publishers identified in both reviews published in 1828. Pickering's letter could only have been addressed to them. And he wrote about examining their dictionary in The American Quarterly Review in 1828. The best Pickering verification comes from Pickering himself. 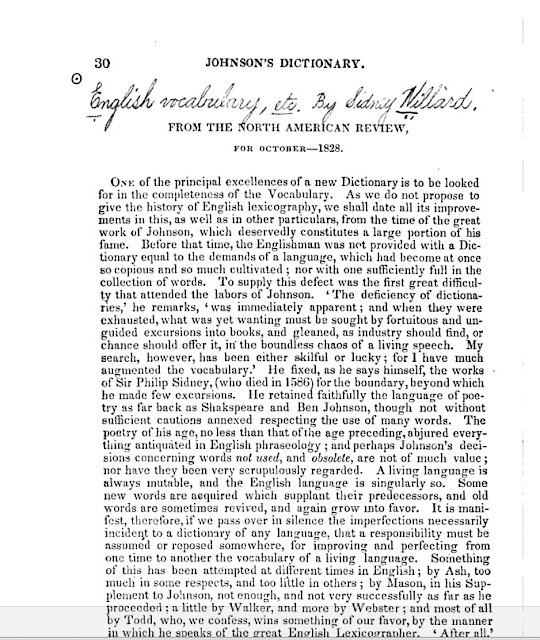 John Pickering's review of Johnson's Dictionary is identified in a list of published writings in his memoir, which was published in 1846 in the Collections of the Massachusetts Historical Society. Sidney Willard (1780-1856) is harder to verify as the author of the review in The North American Review; however, in an article by Julius H. Ward, which appeared in The North American Review in 1915, Sidney Willard is listed as one of the leading contributors to the periodical for the period 1815-1830. Willard, the son of a former President of Harvard University, was the Professor of Hebrew and Other Oriental Languages at Harvard from 1807 to 1831. 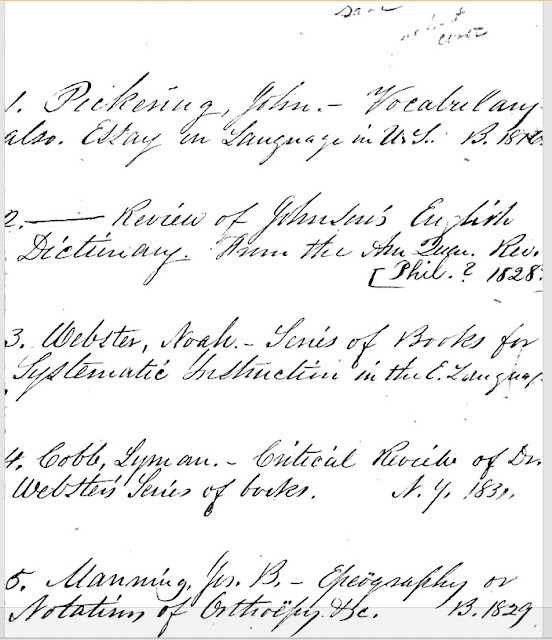 I should note that Allibone's Critical Dictionary ... records that Willard was also the Professor of the English Language (2731). 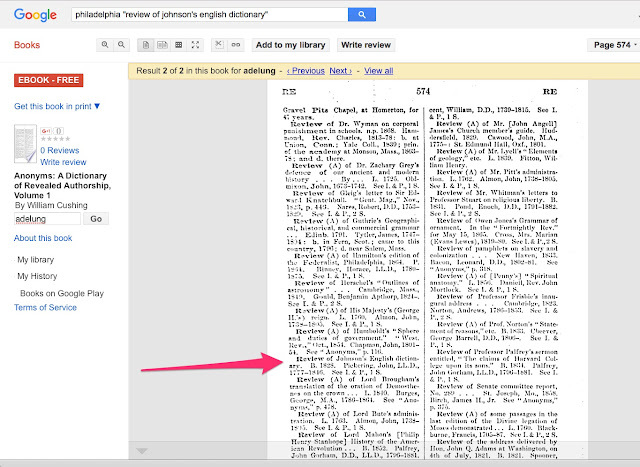 Willard later reviewed Worcester's 1846 dictionary: Universal and Critical Dictionary of the English Language as well. Good question! In 1828, Hiram Tupper, printer for the Examiner Press, Boston, printed Pickering's dictionary review that first appeared in The American Quarterly Review. But the pagination was different than the pagination of the pamphlet that Worcester gave to Harvard, which is identical to the pamphlet I have. Moreover, Tupper's pamphlet did not have Willard's review appended to it. I believe Tupper printed Pickering's review for Pickering. And a still unidentified printer printed both reviews for Worcester. 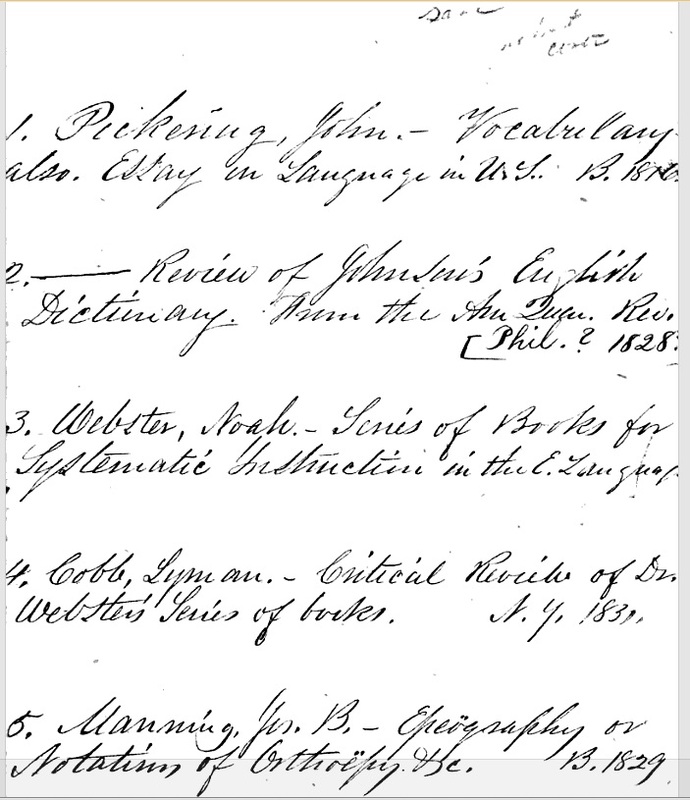 In the list of pamphlets bound with Pickering's vocabulary book, someone wrote, "Phil.? 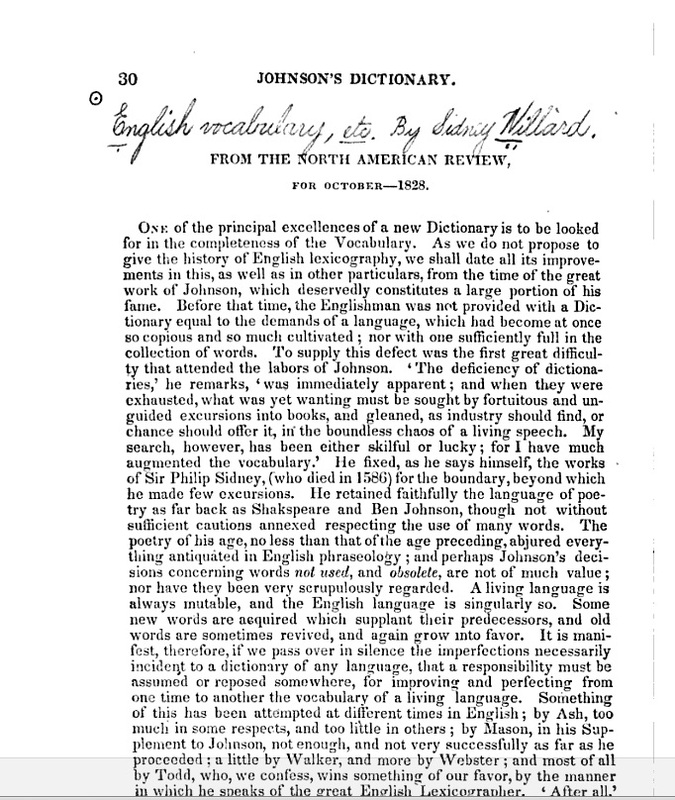 1828, as the place and date of publication of the review of Johnson's Dictionary. However, I believe the pamphlet was printed in either Boston or Cambridge, and most likely by a printer known to either Worcester or Willard—or both. Who was the former owner of the pamphlet? Written in the top right corner of my copy of the pamphlet is the name, "Wm H Spear." Now there were a number of individuals who shared that name. One of them was the proprietor of the Roxbury Female School in Roxbury, Ma., who later was associated with the American Institute of Instruction. I believe this is the William H. Spear who signed his name to my pamphlet. He would have wanted Pickering's review for his students because Pickering not only reviewed Worcester's dictionary, but provided a concise history of dictionaries up to that date. Pickering's review is well worth reading even today. Another "Wm H Spear" was William Henry Spear (1807-1879), the grand nephew of John Hancock, and the heir to the Hancock estate. Could these two Speares be one and the same? Further research is required. For now, I have Wm. H. Spear's signature. And I have a promising lead on one of the Speares! 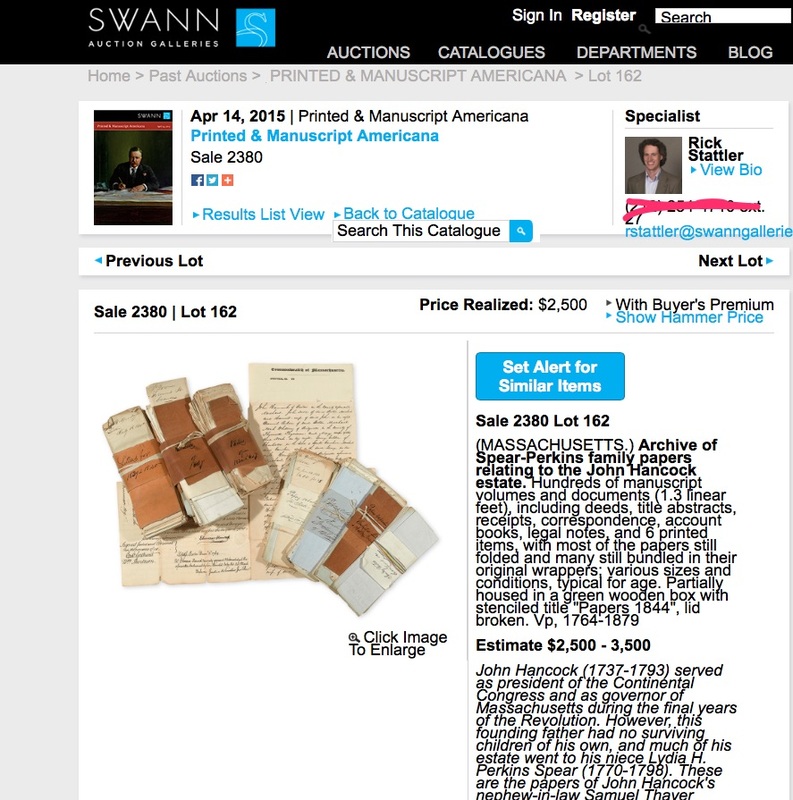 On April 14, 2015, Swann Auction Galleries sold an archive of Spear-Perkins family papers relating to the John Hancock estate. Included in lot 162 were the papers of William Henry Spear (1807-1879). I will ask Swann Galleries to contact the winner of lot 162 and see if he or she will compare the Spear signature I have to that of Hancock's grand nephew, William Henry Spear. Wish me luck on my further research!